About a year ago I co-wrote the book “Bezorgde Vaders” (“Concerned Fathers”), which was published last March. Part of my book contribution was about Mary. On Mother’s day 8 May, I published that part on the web site Artikel7.nu, and I mentioned two strange things that had occurred. For it is now a war of ideas. The fight no longer concerns races and peoples; the fight concerns the spirit. Understand this well! This reminds of Pim Fortuyn’s call for a “Cold war against Islam”. But the origin of the phrase is most remarkable. On February 11, 1951 Mary told it to a visionary in Amsterdam, according to the book “The Messages of the Lady of All Nations“. What about Mary? I believe that Jesus has come for all people, but for many, especially from Asian cultures, it may be difficult to get to know Him. Sill God wants that to happen. I think God has therefore given a major role to Mary, the mother of Jesus. In Catholic doctrine she is called the Immaculate Conception. This means that she was born without original sin. Mary is popular with many Catholics and Eastern Orthodox, but also Muslims, Hindus, Buddhists and even agnostics. They experience a not such a high threshold for Mary not because she is not God himself. But many Protestants are totally against the veneration of Mary; they consider it a form of Christian idolatry: glory to God alone. I understand their concerns. I find these even very well-reasoned, but in my opinion it is really just theory. For me practice counts more than theory. My father and I have repeatedly witnessed something special that seems to confirm the role of Mary. No visions or so, but very strange things that somehow still fit into our material world. One day twelve years ago, I was with my family in Ephesus, Turkey. I visited a small house on a mountainside where Mary the last years of her life would have lived. Like in Lourdes there was a well. Many pilgrims arrived. I also saw Mohammedans who reverently walked through the house. During the Middle Ages, several people would have seen Mary in Delft. This Dutch town became a pilgrimage and the “Nieuwe Kerk” (“new church”) was built . The deceased members of the Dutch Royal Family are buried there. In 1531, an Indian boy in Guadeloupe , Mexico, would have seen Mary. A picture was made of Mary standing on a black crescent moon, which some recognize as the serpent god of the Aztecs. Within seven years after the appearance of the ‘woman who crushes the stone serpent’, eight million Indians asked for baptism. This ended a terrible cult under which thousands of people had been cruelly sacrificed every year to the serpent god. In 1571 the Mohammedans dominated the Mediterranean. The Pope wanted to stop and repel the Muslim enemy that threatened Europe. The Venetians were actually in favor of a peace treaty with the Turkish sultan, but the Pope managed to persuade them. Together with other Italian principalities, they formed a fleet of around 300 ships. On October 7th there was a rosary procession in honor of Mary in St. Peter’s Square in Rome, calling for her help in stopping the Ottoman invasion. On the same day the Christian fleet met the equally sized Turkish fleet at Lepanto, Greece. Suddenly the wind shifted, strongly in favor of the Christians. Partly because of this, the Turks were heavily defeated. For the first time in many years it appeared that victory over Mohammedanism was possible. As a result of this victory, the Catholic Church made October the rosary month. More than a century after the battle of Lepanto, the Polish king Jan Sobieski called for Mary’s help. On 11 and 12 September 1683 his forces defeated the Turks, and ended the siege of Vienna. Since then the Catholic Church celebrates around September 12 the feast of the Holy Name of Mary. 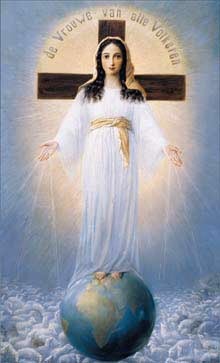 In the 19th century, Mary appeared quite many times, foremost in France. In the Rue du Bac in Paris, a seer saw Mary with stars around her head. A century later this was the inspiration for the flag of the European Union. In 1917 Mary appeared to three shepherd children in Portuguese village Fatima. The place was named after a woman who had converted in the 15th century from Mohammedanism to Christianity; indirectly the place was named after the daughter of Mohammed. On October 13 of that year 60,000 people saw the sun spinning and coming towards them. Recently in 2005 the last of the three seers died, her funeral was a day of national mourning in Portugal. I read that also many Muslims go on pilgrimage to Fatima. In Zeitoun, a district of Cairo, many people witnessed the last century an apparition of Mary. Even Muslims in Egypt are still excited about it. That was very strange; just before mentioning Zeitoun on the web site, I read about it; before and after that I never had encountered the city name Zeitoun on Internet, except when looking for it. January 3, 1946: There will be a fight all over Europe and beyond. It is a heavy spiritual fight. February 7, 1946: Europe must be on its guard; warn the peoples of Europe. (…) Look carefully and listen. The East against the West. Be on your guard, Europe! December 3, 1949: The Netherlands are approaching the downward slope, too. December 10, 1950: There will be periods of apparent tranquility. But this will not last long. The Eastern peoples have been roused by a type of humanity which does not believe in the Son. February 11, 1951: People will seek here and there. Watch out for the false prophets. Seek and ask only for the true Holy Spirit. For it is now a war of ideas. The fight no longer concerns races and peoples; the fight concerns the spirit. Understand this well! (…) Further, I would like to say to all Eastern and Asian peoples, whether they know the Son or not: We are taking care of them. March 28, 1951: Tell that in these modern times, in this modern world, which knows so well how to act promptly and quickly in material affairs, it is equally necessary in spiritual matters to act quickly, promptly and in a modern way. (…) Rome still thinks that she is standing strong, but she is not aware of how she is being undermined. Do you realize how quickly action needs to be taken? Do you realize that theology must give way to the cause of my Son?” (…) Rome must know her task in this time. Does Rome realize which enemy is lying in wait and creeping like a snake throughout the world? And by this I do not mean communism alone; other prophets will come––false prophets. 1 april 1951: theology must give way to the concerns of my Son. By this I mean to say: theologians, the Son always looks for the little and simple for His cause. Do you believe in the little and simple, just as you tell others they should? Simple faith. We have no time for waiting around. This time is Our time. April 29, 1951: have said: this time is Our time. By this I mean the following: the world is caught up in degeneration and superficiality; it does not know which direction to turn. That is why the Father is sending me to be the Advocate, so that the Holy Spirit will come. For the world is not saved by force, the world will be saved by the Spirit. For it is nothing other than ideas which rule the world. Very well then, Church of Rome, know your task. Bring your ideas, bring Christ anew. From the beginning, this clause raised questions. However, Ida Peerdeman said the Lady of All Nations had insisted that it should remain. It would mean that for the first time in history, Mary would not only appeal to Catholics, but to all people, including those who have rejected her, as well as those who do not know her. Many do not understand this excerpt from the prayer and say, “Doesn’t Mary remain Mary“? In the Netherlands, the Amsterdam apparitions are not well known. The painting resides in a chapel in the southern part of Amsterdam. Every Sunday there are pretty well attended masses. Mohammedans are relatively enthusiastic. A Dutch convert has been the only one who has interviewed the visionary. This interview was later included in a DVD: Mary in the Quran. The DVD also contains filmed Quranic verses about Mary, and images of the house of Mary in Ephesus. The chairman of Türkevi, a Turkish Association in the Netherlands, handed the DVD to March 2, 2006 to Prime Minister Balkenende. Two days later, the Prime Minister was campaigning in Amsterdam, and there he received another copy of the DVD from author Robert Lemm. Michael Veling, a local politician for the Christian Democratic Party, pleaded for a large statue of Mary near the Central Station. I had published the original Dutch version of this text at the web site Artikel7.nu, on 8 May 2011, Mother’s Day, second Sunday of May, Mary’s month. That text was in turn largely taken from my contribution to the book “Bezorgde Vaders“. This entry was posted on May 30, 2012 at 6:04 pm and is filed under Uncategorized. You can follow any responses to this entry through the RSS 2.0 feed. You can leave a response, or trackback from your own site.